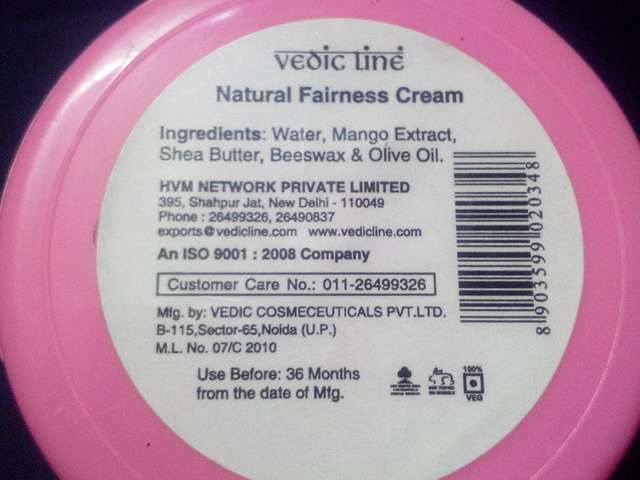 After reviewing lots of Vedic Line Products, I am here with yet another of it, a natural fairness cream. Vedic Line Fairness Cream was lying in my bag since long and finally after trying it for few days, I am here to review it and share my experience with it. The reason which made me buy this cream was that I quite like its range of products, since they are quite herbal and less harmful and secondly my skin looked really tanned in the recent days and I normally avoid fairness skin creams, so thought of trying this herbal one. 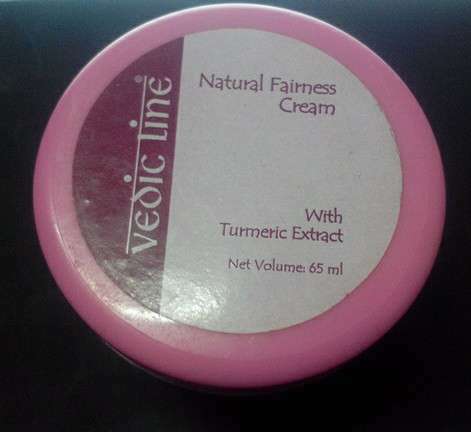 So lets start with the review of this Vedic Line Natural Fairness Cream with Turmeric Extract. Fairness cream with anti-ageing extracts. After use, you get your skin completely hydrated and silky smooth. 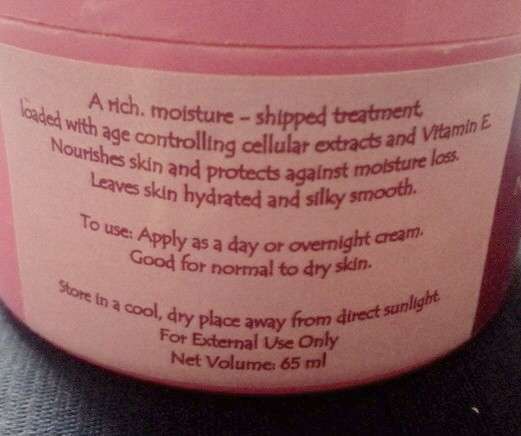 It is good for normal to dry skin. PRICE – Rs 200/- for 65 ml. This natural herbal fairness cream with turmeric extract comes in a regular plastic round jar in pink color which is not so user friendly and hygienic to use but just ok and quite travel friendly without any fear of spillage. The cream looks is pure white in color and looks quite glossy and shimmery unlike regular facial creams which give a creamy effect in texture and looks. At first look, I thought its some sort of shimmering cream. Take a look below. 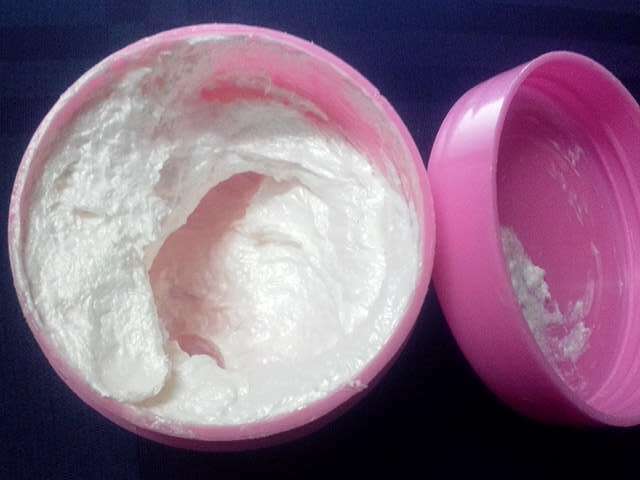 The cream is suggested to be used at night, leaving it overnight. I start my cleaning routine with my regular face wash followed by this cream. Just a little bit of cream is required to cover your entire face. I just take small amount of cream and spread it all over my face massaging gently. Its gets absorbed in the skin quite easily and quickly but leaves a shiny effect on the face which I don’t like. Though its meant for people with dry and normal skin and I am the one with oily acne prone skin, so its my fault for using in on oily skin. But the presence of turmeric extract made me choose this cream, since turmeric is a wonder product for almost all sorts of skin problems. After leaving this fairness cream overnight, my face looked very oily in the morning. I knew this is meant for normal to dry skin but had no idea that it would make my nose and t-zone all oily and shiny. This was one reason I thought of trying this before summer, since this creamy cream would be more of problem in summers. Though its a greasy cream, but it did not aggravate my acne and pimples but yes definitely increase in oiliness and shine was visible. Now coming to its effect in giving a fairer skin as claimed, I did not see any results in my skin tone. Though I have used this cream for about a period of 2 weeks, but I could not see any noticeable difference to share with you all. I don’t know if its because of the oiliness or just few days usage, but I am not very satisfied with the results. Overall I would this cream is an average cream and might be liked by people with dry and normal skin because of its creamy effect but people with oily skin should remain away from this. Regarding fairness effect, I haven’t seen any difference yet but if any noticeable difference is visible anytime, I would update the review with the same. Does not aggravate acne or pimples. Good for dry and normal skin. Makes dry skin look glowing. Nourishes skin nicely removing any dryness. Does not work as a fairness cream as claimed. Makes face oily and shiny. I don't think fairness creams are good anyway. What need at most are products that work on scars and marks.